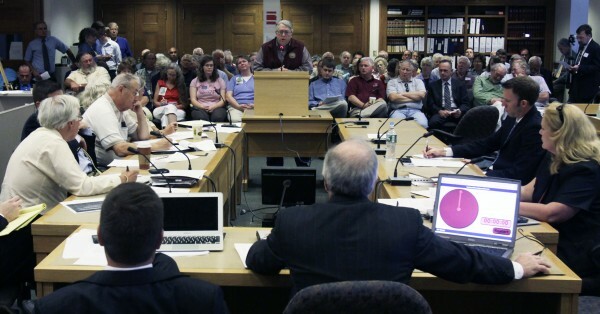 Mainers testify before the Reapportionment Commission at the State House in Augusta on Tuesday, Aug. 23, 2011. Testimony was heard on competing congressional redistricting proposals from the public. A special legislative session is scheduled to take up the issue on Sept. 27. A sticker is seen by one of the Mainers who testified before the Reapportionment Commission at the State House in Augusta on Tuesday, Aug. 23, 2011. Michael Friedman, of Bangor, chairman of the Reapportionment Committee comments while Mainers testify before the commission at the State House in Augusta on Tuesday, Aug. 23, 2011. Testimony was heard on competing congressional redistricting proposals from the public. A special legislative session is scheduled to take up the issue on Sept. 27. AUGUSTA, Maine — About three-quarters of the nearly 50 Maine residents who testified Tuesday supported the Democrats’ plan to keep Maine’s two congressional districts largely the same, but the public comments failed to bring clarity to what has become a fierce partisan battle. Republicans and Democrats on the state’s congressional redistricting commission that’s tasked with redrawing Maine’s political lines heard three hours worth of comments during a public hearing at the State House. Most who spoke favored one of Democrats’ two public plans: Either move Vassalboro in Kennebec County from the 1st to the 2nd District or shift seven towns in Kennebec County between the two districts in order to make the populations equal. A minority of speakers, however, favored the Republicans’ plan for redrawing Maine’s two congressional districts, a plan that would divide the state more east to west than north to south. That plan meets the stated goal of making the districts as equal as possible in terms of population, but also would require nearly one-quarter of Maine to change their congressional district. At least one commenter wondered why there were no independent voices on the redistricting commission given Maine’s large bloc of unenrolled voters — a sentiment that is featured in a lawsuit filed late last week in federal court by a Bangor resident against Gov. Paul LePage. After Tuesday’s hearing was over, the two parties were no closer to a compromise than when they started and time is running out. Maine must redraw its congressional districts every 10 years to reflect updated U.S. Census data. The process has sped up this year because of a federal court order that says the Legislature must decide this by the end of September or else leave it to the courts to decide. Sen. Seth Goodall of Richmond, the lead negotiator for the Democrats, said he was pleased that a majority of the public comments on Tuesday favored his party’s plan. He was surprised, however, that the Republicans did not publicly present an alternative map similar to what he was shown last Friday. “We’re questioning how committed the Republicans are to this plan if they won’t make it public,” Goodall said. “We were very frustrated that our overtures were referred to as ‘a good start,’” she said. The Republicans’ plan B, according to Goodall and Plowman, was similar to the Democrats’ plans in that it focused on moving several towns in Kennebec County. Goodall said Democrats were pleased that the alternative plan left Knox County and Lewiston-Auburn in place but were disappointed that the Kennebec County shift would result in approximately 3,000 Republicans being added to the 2nd District. “That’s the trade-off for keeping Lewiston-Auburn in district two,” Plowman explained, although she said that offer is now off the table. The Republicans’ original plan that sought to move Knox, Lincoln, Sagadahoc and all of Kennebec counties into the 2nd District and move Androscoggin, Oxford and part of Franklin into the first would have added an estimated 8,700 Republicans to the 2nd District. Many Democrats felt the original GOP plan targeted 2nd District Rep. Mike Michaud, who faces reelection next year and could square off against Senate President Kevin Raye of Perry. Maine’s 1st District Congresswoman Chellie Pingree of North Haven has not been spared from the Republicans’ plan either since her home would move into the 2nd District. Plowman did say Tuesday that the GOP would work to address concerns about moving Pingree’s hometown. A large number of public speakers Tuesday hailed from Knox County, which would move from the 1st to the 2nd District under the Republicans’ plan. Nearly all urged the commission to leave their county where it is. Rockland Mayor Brian Harden said his town’s council passed a resolve Monday rejecting the GOP plan and supporting the Democrats’ plan. The Lewiston-Auburn area also was well-represented as it could potentially move from the 2nd District to the 1st District under the GOP plan. 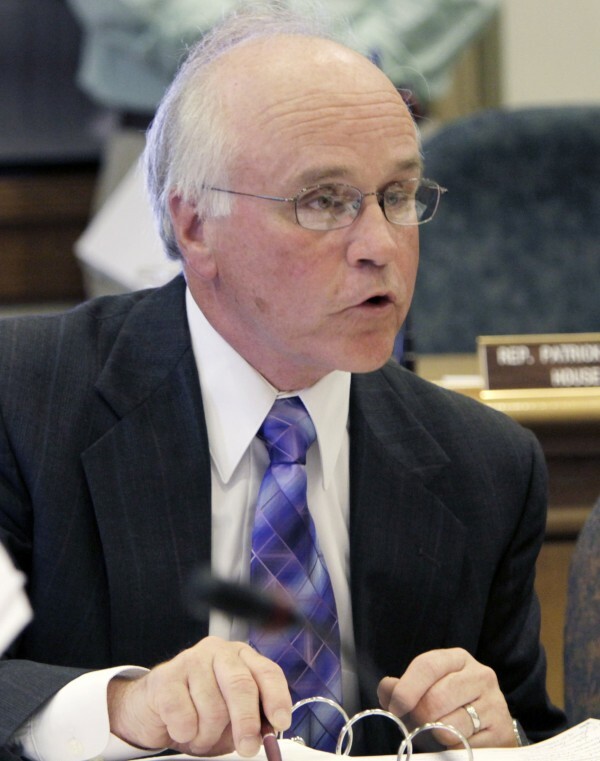 “Under the [GOP] proposal, I fear that Lewiston would take a back seat to the interests, needs, and wants of the wealthier and more densely populated communities to the south or on the coast,” Mayor Larry Gilbert said. Commission member Kenneth Fredette, a Republican representative from Newport, conceded that Tuesday’s comments overwhelmingly favored the Democrats but he wasn’t necessarily influenced by that imbalance. Although most who spoke Tuesday took political sides, many were frustrated with the partisan nature of the redistricting process and wondered if it could be improved. Throughout the process, both Republicans and Democrats have said repeatedly — including again on Tuesday — that they are willing to negotiate and work with each other. Still, both sides also seem comfortable letting the fight last awhile longer. Ben Grant, chairman of the Maine Democratic Party, said the Republicans’ decision to pull their alternative plan at the last minute suggests that there is a division within their caucus. “They are getting pulled in different directions. … I don’t think they know what they want at this point,” he said. The redistricting commission, made up of an equal number of Democrats and Republicans from the Legislature and the public, along with independent chairman Michael Friedman, is scheduled to meet next Monday, Aug. 29. Friedman said the commission would vote at that meeting on its recommendation that will go to the full Legislature on Sept. 27. Grant said he is concerned about what the Republican-controlled Legislature might do in September. 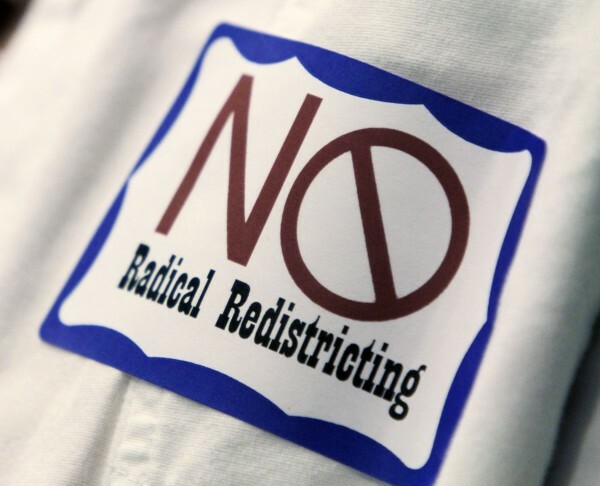 He and others have heard the GOP could try to change the statute in a way that would allow their redistricting plan to pass with a simple majority instead of a two-thirds majority. Republicans did not rule out that possibility Tuesday.